Soldier Blue is a superbly written account of growing up in Rhodesia, centering on the author’s experiences as a young conscript during the bush war . Against the backdrop of the rise and fall of Ian Smith s Rhodesian rebel state (1965-1980), Soldier Blue tells the story of an English boy who grew up in Africa, a soldier who fought, and a dissenter who struggled to define himself against such a backdrop. Sometimes you can’t choose your own battles. 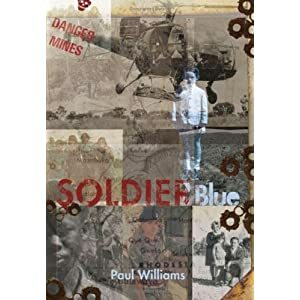 Paul Williams superbly written memoir of coming of age in Rhodesia explores his experiences as a young conscript caught up in the bush war of the late 1970s. This is a compelling, touching and often humorous account of growing up in a straitlaced, racist society and the absurdity of fighting for a dying regime. The ugliness of the conflict, the trauma of transformation, the agonies of conscience of the writer, the beauty of the landscape: all are captured here in brilliant detail. Threading through the narrative is the story of Williams obsessive infatuation with the enigmatic, sharp-tongued Bianca Pennefather, who leads him on a painful emotional and spiritual journey. Looming over this fragile world is the grotesque experience of the battlefield, where young soldiers like Paul Williams inexorably shed their illusions and lost their youth.